Latinos are the fastest growing population group in the U.S. and have exerted widespread influence in numerous aspects of American culture from entertainment to economics. Unlike Asian, black, white, and Native Americans who are defined by race, Latinos can be of any race and are beginning to shed new light on the meanings and political implications of race. As the Latino population grows, how will Latinos come to define themselves racially given the long standing social order of black and white? What are the political implications of their chosen racial identities? How does Latinos’ racial identity influence their political behavior and motivation for participation? The Politics of Race in Latino Communities is an innovative examination of development and political consequences of Latino racial identity in the U.S. Drawing on a national political survey of Latinos and focus group interviews, the book shows that development of Latino racial identity is a complex interaction between primordial ties, institutional practices, individual characteristics, and social interactions. Furthermore, the book highlights the political relevance of identity, showing that racial identity has meaningful consequences for the political attitudes, opinions, and behaviors of Latinos. An important piece of research propelling new discussions and insights into Latino politics. 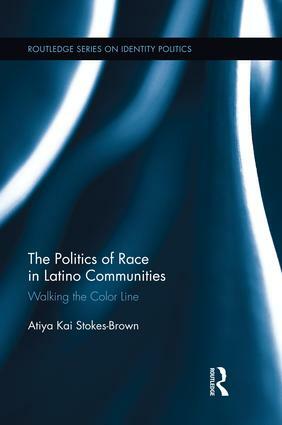 "The Politics of Race in Latino Communities offers important new analysis, exploring how Latinos conceptualize racial identity, how their racial attitudes—about themselves and others—influence political behavior and incorporation, and how scholars can best understand the realities of Latino racial identities, within the framework of Latino panethnicity. Thought-provoking, sometimes controversial, and always well-reasoned, this book should be read by anyone interested in the complex dynamics of contemporary Latino politics. Stokes-Brown reminds us that for Latinos, as for American society more broadly, race matters." "Stokes-Brown explores a critical set of questions around Latino racial self-identification and how these might matter in politics. Her nuanced unpacking of what race means for Latinos suggests that the choice of racial labels—as well as Latinos' interpretations of what these labels mean—is correlated with significant differences in political orientations and behavior. This is a subtle and powerful piece of scholarship." Atiya Kai Stokes-Brown is an assistant professor in the Department of Political Science at Bucknell University, USA. Her research focuses on the political incorporation of women and racial/ethnic groups into the American political system, and issues of representation.